There is much euphoria in the tourism establishment over the Air Passenger Duty (APD) that on 19 March the British government announced would be reduced on flights to and from the Caribbean from April of next year. Since the APD’s introduction, Caribbean tourism officials reckon that the increased cost per ticket has reduced the number of tourists from Britain to the region. The truth is that APD is still high and its cost is still greater for passengers from Britain to the Caribbean than more distant places such as Hawaii in the United States and Vancouver in Canada. The money, energy and intellect that Caribbean governments and tourism organisations poured into lobbying the British government on the unfairness of the APD emphasise the enormous importance of tourism to the economies of most Caribbean countries. In this context a book entitled “Caribbean Tourism” by Dr Jean Holder, launched just two days before the British announcement, assumes a greater relevance than it already had. Dr Holder is uniquely placed to write on Caribbean tourism. He served for 15 years as Secretary-General of the Caribbean Tourism and Research Development Centre and a further 15 years as Secretary-General of the Caribbean Tourism Organisation. “Caribbean Tourism” should be a required text for several disciplines of study at our regional universities for while the book’s central focus is tourism, it is more than that. It examines tourism in the context of the Caribbean’s history in slavery; its colonial division and rivalry; its efforts and failures to create an economic integrated area; and its international relations. Holder makes a compelling case that tourism is now intertwined inexorably with almost every aspect of life of all Caribbean countries – some more than others for sure, but certainly all who regard tourism as a contributor to their economic development. 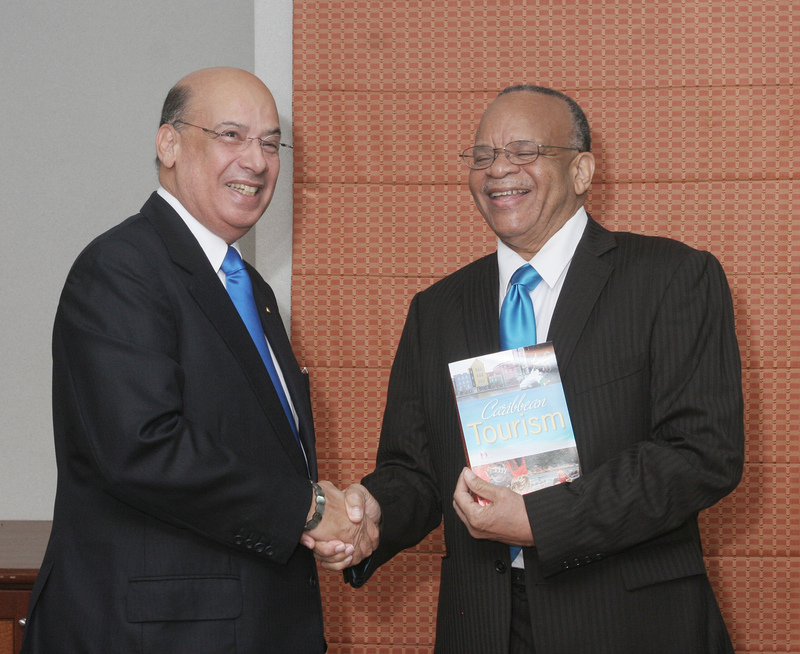 The life-long journey that Holder has undertaken in tourism is reflected in every page. And that is what distinguishes it from any other book that has been produced about Caribbean Tourism. It is as scholarly as any other – if not more so. Its research is meticulous and well documented. Its argument is cogent, and well supported. But, its knowledge and authority, born of living every day of decades of Caribbean Tourism, is what gives it its towering authenticity. Jean Holder’s is no voice crying from the margins of the tourism industry; his calls are no expressions of self-interest; he has written with the strength of one who has done decades of unselfish battle in tourism’s arena – to promote it, to develop it, to persuade doubting Caribbean leaders of the weakness of their misgivings, to argue even in the face of insults, and to take on challenges from competitors much stronger and considerably more powerful than our Caribbean states. In exploring the evolution of tourism as a crucial industry for many Caribbean economies, Holder has lifted the lid on the lingering resentment to the industry that originates in slavery and its pernicious order that compelled black people to life-long servitude to white owners. It is an important discussion to open. Not to cause festering wounds to erupt, but to heal them so that, as a civilization, Caribbean people can move on. Tourism is about service, not servitude. There is dignity, honour and respect in service respectfully given, in a context of hospitality and welcome, for fair recompense. It is the very antithesis of the humiliation, dehumanisation, and coercion that were the hallmarks of servitude. As Holder says in his book: “Caribbean people have been able to overcome the adverse social conditions they inherited and, in modern times, to develop a competitive industry which has permitted them to enjoy a standard of living which remains the envy of large developing countries”. Of course that envy has led to realisation in large developed countries that they should turn jealousy to opportunity. By doing so, these large developed countries – particularly the United States and the United Kingdom – are developing their own tourism markets more aggressively, posing real and pressing dangers to Caribbean tourism. Holder details these dangers. Among them is the APD that the British Government applies to air fares out of the United Kingdom – still at an unfair level in relation to the Caribbean despite the reduction announced on 19 March. Jean links the APD to the present British government’s strong determination to maximise earnings from tourism and he concludes that: “The controversial British APD was being viewed by many observers as part of a strategy to support domestic tourism which its Prime Minister had expressed a desire to see grow by 50 per cent at the expense of outward bound tourism”. There is, therefore, much work to be done if the Caribbean is to maintain and expand a beneficial share of global tourism. Drawing on his formidable experience, Holder makes a telling point that: “In tourism, unlike in the case of the export of sugar and bananas, the region’s horizons are not circumscribed by old connections with former colonial powers that, in any case, no longer carry the burden of guilt caused by colonial exploitation. The tourism world is indeed the Caribbean’s oyster”. But exploiting tourism to its fullest will not happen without investment, marketing and intellect of all the participants in the industry collectively, including governments. In this regard, recalling the enlightened leadership of the Caribbean in the 1960s and 1970s and the support given by the intellectual muscle of brilliant technicians that earned the region international respect and significant integration achievements, Holder says: “Perhaps the time has come for Caribbean leaders to convene a second conference on the present and future of Caribbean tourism as was first done in 1975”. And, he provides a detailed agenda that such a Summit should tackle. It will be interesting to see if Caribbean leaders pick up the gauntlet, Holder has thrown on to their council table. For, as he says, “for the foreseeable future at any rate, tourism and related services will remain the best prospect for the economic development of the Caribbean region”, and the region’s leaders should “accept finally that Caribbean collaboration offers the best hope for success”. “Caribbean Tourism” by Jean S Holder ISBN 978-976-653-015-0 is published by Canoe Press, Kingston, Jamaica.